This is a point where you can safely stop the protocol and store the samples prior to proceeding to the next step in the protocol. This caution sign signifies a step in the protocol that has two paths leading to the same end point but is dependent on a user variable, like the type of RNA input. The protocol has been optimized using high quality Universal Human Reference Total RNA. Assess the quality of the input RNA by running the RNA sample on an Agilent Bioanalyzer RNA 6000 Nano/Pico Chip to determine the RNA Integrity Number (RIN). RNA with different RIN values require different fragmentation times or no fragmentation at all. For intact (RIN > 7) or partially degraded RNA samples (RIN = 2 to 7) follow the library preparation protocol in Chapter 2. For highly degraded samples (RIN = 1 to 2) (e.g. FFPE), which does not require fragmentation, follow the library preparation protocol in Chapter 3 (current chapter). Treat the RNA sample with DNase I to remove all traces of DNA. Remove DNase I after treatment. The RNA sample should be free of salts (e.g., Mg2+, or guanidinium salts), divalent cation chelating agents (e.g. EDTA, EGTA, citrate), or organics (e.g., phenol and ethanol). 10 ng – 100 ng FFPE RNA in up to 12 μl of Nuclease-free Water, quantified by Qubit Fluorometer and quality checked by Bioanalyzer. 3.1.1. Dilute the total RNA with Nuclease-free Water to a final volume of 12 μl in a PCR tube. Keep the RNA on ice. 3.1.3. Add 3 µl of the above mix to 12 µl total RNA sample (from Step 3.1.1), resulting in a total volume of 15 µl. 3.1.4. Mix thoroughly by pipetting up and down several times. 3.1.5. Briefly spin down the sample in a microcentrifuge. 3.1.7. Briefly spin down the samples in a microcentrifuge, and place on ice. Proceed immediately to RNase H Digestion Step. 3.2.1. Assemble the RNAse H master mix on ice as follows. 3.2.2. Mix thoroughly by pipetting up and down several times. 3.2.3. Briefly spin down the samples in a microcentrifuge. 3.2.4. 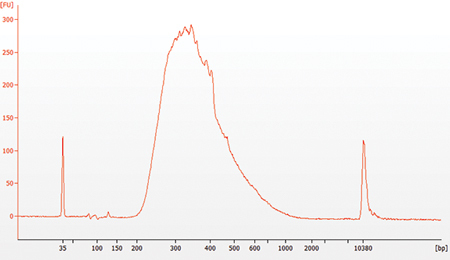 Add 5 µl of the RNase H master mix to the RNA sample from Step 3.1.7, resulting in a total volume of 20 µl. 3.2.5. Mix thoroughly by pipetting up and down several times. 3.2.6. Incubate the sample in a thermal cycler for 30 minutes at 37°C with the lid set to 40°C. 3.2.7. Briefly spin down the samples in a microcentrifuge, and place on ice. Proceed immediately to DNase I Digestion to prevent non-specific degradation of RNA. 3.3.1. Assemble DNase I digestion master mix on ice in a nuclease-free tube. 3.3.2. Mix thoroughly by pipetting up and down several times. 3.3.3. Briefly spin down the samples in a microcentrifuge. 3.3.4. Add 30 μl of DNase I digestion master mix to 20 μl RNA sample from Step 3.2.7, resulting in a total volume of 50 μl. 3.3.5. Mix thoroughly by pipetting up and down several times. 3.3.6. Incubate the samples in a thermal cycler for 30 minutes at 37°C with the heated lid set to 40°C. 3.3.7. Briefly spin down the samples in a microcentrifuge, and place on ice. Proceed immediately to RNA purification. 3.4.1. Vortex the RNAClean XP or RNA Sample Purification Beads to resuspend. 3.4.2. Add 110 µl (2.2X) beads to the RNA sample from Step 3.3.7 and mix thoroughly by pipetting up and down at least 10 times. 3.4.3. Incubate the sample for 15 minutes on ice to bind RNA to the beads. 3.4.4. Place the tube on a magnetic rack to separate beads from the supernatant. After the solution is clear, carefully remove and discard the supernatant. Be careful not to disturb the beads, which contain RNA. 3.4.6. Repeat Step 3.4.5 once for a total of 2 washing steps. 3.4.7. Completely remove residual ethanol, and air dry the beads for ~2-5 minutes while the tube is on the magnetic rack with lid open. Caution: Do not overdry the beads. This may result in lower recovery of RNA. 3.4.8. Remove the tube from the magnetic rack. Elute the RNA from the beads by adding 7 µl Nuclease-free Water. Mix well by pipetting up and down several times and briefly spin the tube. 3.4.9. Incubate for 2 minutes at room temperature. Place the tube in the magnet until the solution is clear (~2 minutes). 3.4.10. Remove 5 µl of the supernatant containing RNA and transfer to a nuclease-free tube. 3.4.11. Place the sample on ice and proceed to Priming of Highly Degraded RNA. 3.5.2. Mix thoroughly by pipetting up and down several times. 3.5.3. Briefly spin down the samples in a microcentrifuge. 3.5.4. Incubate the sample in a preheated thermal cycler as follows. 5 minutes at 65°C, with heated lid set at 105°C. 3.5.5. Transfer the tube directly to ice and proceed to First Strand cDNA Synthesis. 3.6.2. Keeping the tube on ice, mix thoroughly by pipetting up and down several times. 3.6.4. Proceed directly to Second Strand cDNA Synthesis Reaction. 3.7.1 Assemble the second strand cDNA synthesis reaction on ice by adding the following components to the first strand reaction product from Step 3.6.4. 3.7.2 Keeping the tube on ice, mix thoroughly by pipetting up and down several times. 3.7.3 Incubate in a thermal cycler for 1 hour at 16°C with the heated lid set at ≤ 40°C. 3.8.1. Vortex SPRIselect beads or NEBNext Sample Purification Beads to resuspend. 3.8.2. Add 144 μl (1.8X) of resuspended beads to the second strand synthesis reaction (~80 μl). Mix well on a vortex mixer or by pipetting up and down at least 10 times. 3.8.3. Incubate for 5 minutes at room temperature. 3.8.4. Briefly spin the tube in a microcentrifuge to collect any sample on the sides of the tube. Place the tube on a magnet to separate beads from the supernatant. After the solution is clear, carefully remove and discard the supernatant. Be careful not to disturb the beads, which contain DNA. 3.8.5. Add 200 μl of freshly prepared 80% ethanol to the tube while in the magnetic stand. Incubate at room temperature for 30 seconds, and then carefully remove and discard the supernatant. 3.8.6. Repeat Step 3.8.5 once for a total of 2 washing steps. 3.8.7. Air dry the beads for 5 minutes while the tube is on the magnet with lid open. Caution: Do not overdry the beads. This may result in lower recovery of DNA. 3.8.8. Remove the tube from the magnet. Elute the DNA from the beads by adding 53 μl 0.1X TE Buffer (provided) to the beads. Mix well on a vortex mixer or by pipetting up and down several times. Quickly spin the tube and incubate for 2 minutes at room temperature. Place the tube on the magnetic rack until the solution is clear. 3.8.9. Remove 50 µl of the supernatant and transfer to a clean nuclease free PCR tube. If you need to stop at this point in the protocol, samples can be stored at –20°C. 3.9.1. Assemble the end prep reaction on ice by adding the following components to the second strand synthesis product from Step 3.8.9. 3.9.2. Set a 100 μl or 200 μl pipette to 50 μl and then pipette the entire volume up and down at least 10 times to mix thoroughly. Perform a quick spin to collect all liquid from the sides of the tube. Note: It is important to mix well. The presence of a small amount of bubbles will not interfere with performance. 3.9.3. Incubate the sample in a thermal cycler with the heated lid set at ≥ 75°C as follows. 3.9.4. Proceed immediately to Adaptor Ligation. 3.10.1. Dilute the (red) NEBNext Adaptor* prior to setting up the ligation reaction in ice-cold Adaptor Dilution Buffer and keep the diluted adaptor on ice. *The adaptor is provided in NEBNext Singleplex (NEB #E7350) or NEBNext Multiplex (NEB #E7335, #E7500, #E7710, #E7730, #E6609 or #E7600) Oligos for Illumina. 3.10.2. Assemble the ligation reaction on ice by adding the following components, in the order given, to the end prep reaction product from Step 3.9.4. Note: The Ligation Master Mix and Ligation Enhancer can be mixed ahead of time and is stable for at least 8 hours @ 4°C. We do not recommend premixing the Ligation Master Mix, Ligation Enhancer and adaptor prior to use in the Adaptor Ligation Step. 3.10.3. Set a 100 μl or 200 μl pipette to 80 μl and then pipette the entire volume up and down at least 10 times to mix thoroughly. Perform a quick spin to collect all liquid from the sides of the tube. Caution: The NEBNext Ultra II Ligation Master Mix is very viscous. Care should be taken to ensure adequate mixing of the ligation reaction, as incomplete mixing will result in reduced ligation efficiency. The presence of a small amount of bubbles will not interfere with performance. 3.10.4. Incubate 15 minutes at 20°C in a thermal cycler. 3.10.5. Add 3 μl (red) USER Enzyme to the ligation mixture from Step 3.10.4, resulting in total volume of 96.5 μl. Note: Steps 3.10.5 and 3.10.6 are only required for use with NEBNext Adaptors. USER enzyme can be found in the NEBNext Singleplex (NEB #E7350) or Multiplex (NEB #E7335, #E7500, #E7710, #E7730, #E6609 or #E7600) Oligos for Illumina. 3.10.6. Mix well and incubate at 37°C for 15 minutes with the heated lid set to ≥ 45°C. 3.10.7. Proceed immediately to Purification of the Ligation Reaction. 3.11.1. Add 87 μl (0.9X) resuspended SPRIselect Beads or NEBNext Sample Purification Beads and mix well on a vortex mixer or by pipetting up and down at least 10 times. 3.11.2. Incubate for 10 minutes at room temperature. 3.11.3. Quickly spin the tube in a microcentrifuge and place the tube on an appropriate magnetic rack to separate beads from the supernatant. After the solution is clear (about 5 minutes), discard the supernatant that contains unwanted fragments. Caution: do not discard the beads. 3.11.4. Add 200 μl of freshly prepared 80% ethanol to the tube while in the magnetic rack. Incubate at room temperature for 30 seconds, and then carefully remove and discard the supernatant. 3.11.5. Repeat Step 3.11.4 once for a total of 2 washing steps. 3.11.6. Briefly spin the tube, and put the tube back in the magnetic rack. 3.11.7. Completely remove the residual ethanol, and air dry beads until the beads are dry for 5 minutes while the tube is on the magnetic rack with the lid open. Caution: Do not over dry the beads. This may result in lower recovery of DNA. 3.11.8. Remove the tube from the magnetic rack. Elute DNA target from the beads by adding 17 μl 0.1X TE (provided) to the beads. Mix well on a vortex mixer or by pipetting up and down, incubate for 2 minutes at room temperature. Put the tube in the magnet until the solution is clear. 3.11.9. Without disturbing the bead pellet, transfer 15 μl of the supernatant to a clean PCR tube and proceed to PCR enrichment. Follow Section 3.12.1B if you are using NEBNext Multiplex Oligos for Illumina (96 Index Primers, NEB #E6609). 3.12.1. Set up the PCR reaction as described below based on the type of oligos (PCR primers) used. 3.12.2. Mix well by gently pipetting up and down 10 times. Quickly spin the tube in a microcentrifuge. *The number of PCR cycles should be adjusted based on RNA input. The recommendation of PCR cycles are based on internal tests for FFPE RNA. **It is important to limit the number of PCR cycles to avoid overamplification. If overamplification occurs, a second peak ~1,000 bp will appear on the Bioanalyzer trace. 3.13.1. Vortex SPRIselect Beads or NEBNext Sample Purification Beads to resuspend. 3.13.2. Add 45 μl (0.9X) of resuspended beads to the PCR reaction (~ 50 μl). Mix well on a vortex mixer or by pipetting up and down at least 10 times. 3.13.3. Incubate for 5 minutes at room temperature. 3.13.4. Quickly spin the tube in a microcentrifuge and place the tube on an appropriate magnetic rack to separate beads from the supernatant. After the solution is clear (about 5 minutes), carefully remove and discard the supernatant. Be careful not to disturb the beads that contain DNA targets. 3.13.5. Add 200 μl of freshly prepared 80% ethanol to the tube while in the magnetic rack. Incubate at room temperature for 30 seconds, and then carefully remove and discard the supernatant. 3.13.6. Repeat Step 3.13.5 once for a total of 2 washing steps. 3.13.7. Air dry the beads for 5 minutes while the tube is on the magnetic rack with the lid open. 3.13.8. Remove the tube from the magnetic rack. Elute the DNA target from the beads by adding 23 μl 0.1X TE (provided) to the beads. Mix well on a vortex mixer or by pipetting up and down, quickly spin the tube in a microcentrifuge and incubate for 2 minutes at room temperature. Place the tube in the magnetic rack until the solution is clear. 3.13.9. Transfer 20 μl of the supernatant to a clean PCR tube, and store at –20°C. 3.14.1. Run 1 μl library on a DNA High Sensitivity Chip. 3.14.2. Check that the electropherogram shows a narrow distribution with a peak size approximately 300 bp. Note: If a peak at ~ 80 bp (primers) or 128 bp (adaptor-dimer) is visible in the bioanalyzer traces, bring up the sample volume (from Step 3.13.9) to 50 μl with 0.1X TE Buffer and repeat the SPRIselect Bead or NEBNext Sample Purification Bead Cleanup Step (Section 3.13). Figure 3.14.1: Example of FFPE RNA library size distribution on a Bioanalyzer.